Side Dish dives into the world of food investigations. Through artistic installations we address eating and its experience, its habits, the buying behaviours formed around it, thinking of a broader reconsideration of the products and matters we eat. 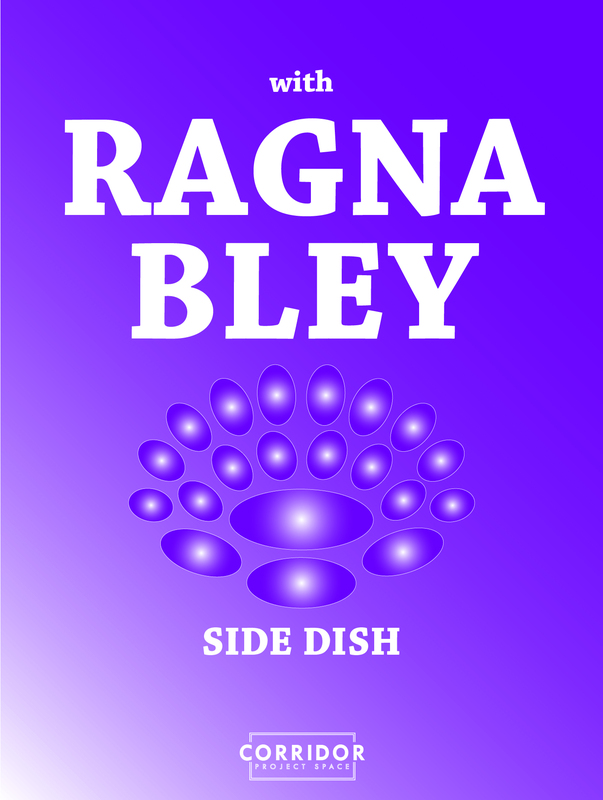 For the second Side Dish we have invited Ragna Bley, a painter who’s work expands into the realm of food. On the 3rd of May, she will create jelly-landscapes, invading tables and the exhibition space. Attractive and worrisome, her installation will evoke historical entertainment in European royal courts, 70’s nostalgia, instagram slime, aquarium habitats or materials for under-skin fillings. The jellies will be accompanied by low frequency sonic interventions, in the form of spells calling forth the words of Vladimir Nabokov. The wobbly visceral structures will be ready for inhaling, eyeballing and ingesting. During the night, researcher Tim van Koolwijk will present his work based on Spirulina, a relatively new ingredient in our cuisine. Tim is the founder of Spireaux, a company producing fresh spirulina paste, a healthy, vegan and sustainable ingredient used to fortify a wide variety of existing food products. Their fresh spirulina contains essential amino acids, food fibres, vitamins, minerals, antioxidants and polyunsaturated fatty acids. Spireaux has recently developed led-based photobioreactors in order to produce the spirulina paste in and near urban environments for a fraction of the ecological cost of other protein sources, allowing its production in regions presenting unsuitable climate conditions. Axe & Porridge (Sander Uitdehaag and Veniamin Kazachenko) will cook a meal in dialogue with Ragna’s and Tim’s research. They will serve a lovely dinner composed of vegetarian dishes made of fresh ingredients. The spontaneously combusted duo Axe & Porridge operates both as artists and chefs. The ability to appropriate both artistic and culinary domains ‘en flux’ by cooking in a guerrilla style, improvising and meeting new people, characterizes the duo. Exploring the interstice, Axe & Porridge will be providing the menu for the four upcoming events of Side Dish. Within Side Dish, we have invited artists who approach food in a different way in order to share their preoccupations with a larger audience and extend their explorations through public discussions. Food can be used in their work as a theme, material or consider the food chain as subject of their practice. In the 5 Side Dish events throughout the year, each artist will collaborate with an expert – a professional involved in the local food production – and a chef. During these evenings we will share food with the audience (in the form of a dinner or a more experimental structure) alongside talks. Corridor Project Space is an independent and interdisciplinary contemporary art initiative in Amsterdam with indoor and outdoor exhibition spaces. They believe in the importance of experimental art practices that focuses on the creation of new content that is off the grid from the institutional and commercial circles. Corridor Project Space is run by Suzan Kalle, Suat Öğüt and Müge Yılmaz and our lovely colleagues and volunteers! Special thanks to Nolwenn Salaün. Side Dish is supported by Amsterdam Fund of the Arts and the Municipality of Amsterdam and The Office for Contemporary Art Norway.